I came to watercolors 3 years ago when I took an online class with the fabulous Jane LaFazio. Her work is fresh and fun and she’s a marvelous teacher, generous with her time, knowledge and especially her gentle encouragement. I’m still a frequent visitor to her website and blog. 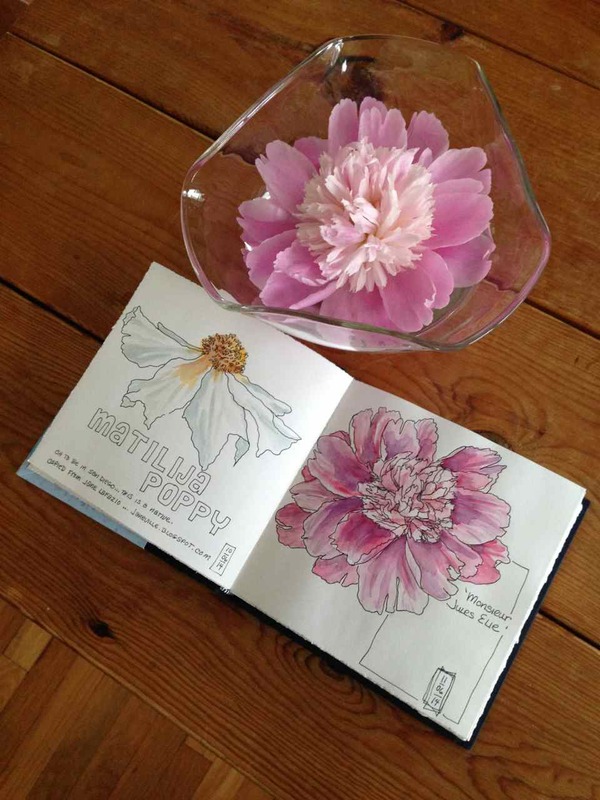 As I looked through her class offerings I saw her sketch of a Matilija Poppy blossom. Jane had captured this beauty with a minimalist line and a few splashes of watercolor… I was inspired! My garden has been calling to me… “paint me, paint me.” But where to start? I snipped and floated one of my favorite peony blooms to be my first model! I’ve been experimenting with various pens but for this I returned to my tried and true favorites… my TWSBI fountain pen filled with Platinum Carbon Black ink. To get the cool, icy pink of the petals I used multiple dilute glazes of Quinacridone Rose and deepened the shadows with Indanthrone Blue. Since the forecasted wind and rain would doom the last of my poppies, this was my only chance. They’re so ephemeral. I stood in the driveway painting as the rain started to fall. Whew! Finished just in time! They’re gone now, petals scattered on the ground, just a bunch of seedpods ripening for next year. This entry was posted in Ink and Watercolor Wash and tagged Flowers, Garden, Jane LaFazio, Pen and Ink, Platinum Carbon Black, TWSBI, Watercolor by Dana Burrell. Bookmark the permalink. The flower pictures are gorgeous. I guess I am intimidated by the natural organic world. I go outside and see these beautiful pine trees and maple trees. all the leaves being hit by ever changing light. It blows my mind and becomes abstract. Even with flowers, so much detail needs to be done! I know that I can most likely draw anything as long as I do not put a name or label on it. Nevertheless, the patterns of the outdoors blows my mind. I guess I will stick to my pencils and figure drawings. Congratulations on the courage to do this and your success at it! Ted Giffin, Ah… you’ve hit on it! Labels! …the organic nature of a flower is not so different than a portrait or a figure. Wasn’t it Klee who said that a “drawing is taking a line for a walk”? Whether we are drawing a blossom or a hand, the art is in the observation and translation to the paper. That is a great quote from Klee. I like to imagine my lines actually having feeling as I am drawing. Imaging caressing the flowers or subject matter, being sensitive to what it is, the line as a sense of touch! I really love your voluptuous flower pictures.